These original merit badges are being offered once again to celebrate the 100th anniversary of Scouting. They will be using the original requirements (with supplemental information) and can be earned between April 1 to December 31, 2010. 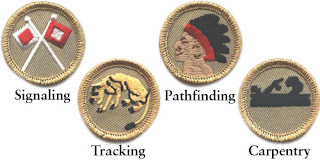 These do count toward a Scout’s rank advancement and each merit badge features a gold border to identify it as a special centennial year badge. More information can be found at the Scouting.org website.